Hossein Alizadeh is a Iranian composer, Radif-preserver, researcher, setar instrumentalist and improviser. He is considered by critics to be one of the most influential artists of his generation. He has been nominated for the 2007 Grammy Award along with Armenian musician, Djivan Gasparyan, for their collaboration album, The Endless Vision. 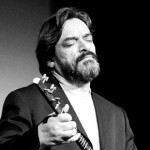 In 2008, he was voted as “Iran’s most distinguished musician of the year”. His songs like Call of the Birds have strong mystic influences. Download more collaboration music by Hossein Alizadeh and Madjid Khaladj.